I really enjoyed the movie version of Les Miserables, the musical. It was a masterful interpretation of Victor Hugo’s literary classic, with superb acting. The message of this film, at its core, is one of forgiveness, charity, and democracy. In a word, it can be called liberal. This makes me wonder why so many conservatives celebrate this musical. Yes, there is a spiritual theme that many on the religious right may find appealing. Yet I can’t understand how they miss the overwhelming liberal message in this story. The title can be translated from the French as The Miserable, The Wretched, The Poor Ones, The Wretched Poor, or The Victims. The story illustrates the horrors of poverty and unbridled laissez faire capitalism, including child servitude and horendous work conditions (hostile workplace, sexual harassment, etc.). It also captures the evils of an undemocratic, heavy-handed state, including cruel treatment of prisoners and a murderous response to popular protest. Remember, it is liberals and progressives who struggled to do aways with these practices; and it is conservatives who want to return to an unregulated market with little or no safety net. There is also a revolutionary theme in the story. “Do you hear the people sing/singing the song of angry men/it is the music of a people who will not be slaves again.” The revolution is about restoring power to the people. It is liberals who promote political equality; and it is conservatives who over-represent the interests of big business and the wealthy. Jean Vajean is a man who was reformed, not from his 19 years of prison time, but through the compassion of a Bishop. The Bishop gave Valjean a valuable collection of silver, and Valjean was able to escape from poverty and crime to become a business owner and government official. Valjean did not deserve this handout (“entitlement”) from the Bishop, and the Bishop had no reason to expect that the silver would be put to good use. But this unexpected act of charity gave Valjean an opportunity to become an honest, self-reliant man. It is liberals who believe in equal opportunity for all; who believe rehabilitation is more effective than jail time; who believe we need a safety net to prevent extreme poverty and suffering. It is conservatives who want to dismantle the safety net so they can lower taxes on their rich donors; they want a heavy-handed state with a military that is bigger than all others combined; they want to strengthen the prison industrial complex, and they want to criminalize drugs, illegal immigration, but then go soft on white collar crime. In my last post, I wrote about the contradiction between the conservatives’ reverence for Christmas on the one hand and the fact that their beliefs closely resemble Christmas villains like Scrooge and Mr. Potter on the other hand. I think there is a similar dissonance in how they watch Les Miserables. They are likely to see a religious theme; that God blesses people for their righteousness. Yet, the story does not fit that interpretation. The story does not fit into that world view about God punishing the wicked and rewarding the righteous. Instead, it captures real life. And it seem to be urging viewers to be more charitable to others, especially the undeserving—through private acts of charity, forgiveness, donating to good causes, and yes, supporting government-run “entitlement” programs and regulations that prevent our society from returning to the horrific conditions of the industrial revolution that is captured in Hugo’s work. That is a powerful Christian/liberal message, one that many conservatives talk about at church, but vote against in every election. Previous Entry: Why are Christmas villains always conservative? Thanks for the interesting article. I just got back from seeing the movie and the topic of liberalism versus conservatism came up with me wife during the ride back home. The conservative values in the film were very evident to me, though I could see how many would see liberal values just the same. Conservatives are not evil people. Your portrayal of them is, in my view, inaccurate. I suggest checking out the work done by Dr. Arthur C. Brooks. He grew up in a liberal home in liberal Seattle (my hometown), raised by two liberal professors. He ran studies on charitable giving, expecting to find that liberals gave more of both their time and money to charitable causes. What he found was that, despite liberal homes having higher overall incomes (by 6%) than conservative homes, the conservatives gave 30% more of their money and 12% more of their time. They even give more of their blood away. He initially thought their must have been something wrong with his data or his analysis, but when he found that this was not the case he found that he was full of misconceptions about conservatives and eventually became one himself. I think there is a basic philosophical difference between the two groups. Neither are evil, but you’ll find that the strategies employed in benefiting the people are different. You’ll be very hard pressed to find a conservative who would support anything that would make sexual harassment or child labor easier. You’ll also find that the history of banning these things is a lot less partisan than you’ve been led to believe. Conservatives do believe in government protections and a safety net, but not when they cross certain lines. Those lines exist because conservatives believe that by crossing them you introduce new problems that would in the end hurt those they are trying to help. Often times private charity is the solution, and I think this is why you see the numbers I mentioned earlier. It is unfortunate that conservatives are seen as being less compassionate to the poor, when our policies are designed to maximize opportunity and an overall net increase in wealth over time for that sector. It is not that we want lower taxes for the rich, it is that we want lower taxes for everyone. By unduly targeting the rich with tax increases, we believe that it will have unintended consequences that would hurt everyone including the poor. I wish I had time to go into it in this comment, but my point is that your article, though interesting and a good read, was probably unfair to the majority of conservatives. It’s unfortunate that there are so few public conservatives that can voice the true values of conservatives these days. You guys certainly seem to have more effective communicators these days. Wes, thanks for your comment. I agree with you that there are few if any conservative voices who are effectively articulating the values of conservatism today. Unfortunately, the action of the Republican Party over the last several decades have been so skewed toward with wealthy that any discussion of their values is overshadowed by their actions, which have done the EXACT OPPOSITE of what you mentioned in your comment. That is, you mentioned that conservatives want to create opportunity and greater wealth for all. Yet, their policies have significantly redistributed wealthy upwards, increased inequality, with middle class wages stagnated and management/executive wages increasing many times. On the other point you made concerning helping the poor, I agree that there is an important place for private institutions, such as churches, to assist the poor and needy. However, these channels can’t possibly serve all of the people who have needs, and they certainly would not do it in a fair way. Therefore, the history poverty in America tells us that there is an absolute need for government programs. We can debate about how extensive these programs should be, but these program are needed, and they provide an important economic buffer that is helpful to businesses (for example, unemployment insurance helps keep a level of demand for goods and services during a recession–research shows a solid ROI for unemployment insurance; this is just one example of many that could be given). Republicans have shown an laser focus on dismantling social programs over the past several decades. When they push policies that help big business and the wealthy (not “all people”), and seek to destroy programs that help the disadvantaged, this tells us something about their real values. Whatever they say, this is what they have DONE. 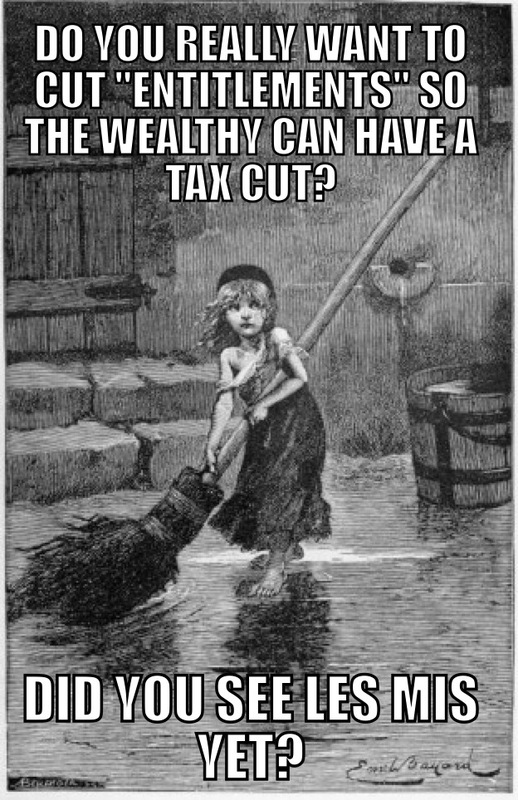 I would love to hear a conservative who would say: let’s keep social programs, but I have a great way to do it more efficiently without trying to introduce the profit motive (which will inevitably force profit-seekers to withhold needed services rather than help based on needs); let’s get out of debt in a responsible way, which must include increase tax revenues; let’s find ways to increase freedoms, not just the freedoms that I cherish (guns), but freedoms I personally disagree with (abortion, gay rights); let’s keep a strong military, but it is irresponsible to keep spending at Cold War levels (more than all other nations combined); let’s make it easier to start a business; let’s REALLY help all workers experience a better life as they work harder, not just those who are in management roles (this might mean strengthening unions in some ways); etc. This would tell me that we have a conservative that cares about all people, and actually have principles. Again, I don’t hear this kind of talk; and the actions that I see only have one common theme: help the wealthy hurt everyone else. I am definitely prompted and your writing skills along with with all the arrangement for your blog page. Is any paid for subject material or maybe does one customize this on your own? Anyways be in the outstanding high quality crafting, it truly is uncommon to peer a great web site such as this one today. Previous Entry Why are Christmas villains always conservative?